An |Uplifting| experience! The classic stilts design has been made a whole lot better... a whole lot easier to learn and easier to use, more ergonomically correct, and much more FUN! Traditional stilts are simply straight poles with foot platforms attached to the sides. Unfortunately, the tops of the poles rest uncomfortably behind the shoulders, which forces the upper body to slump forward and hinders balance. Not ours! Walkaroo Stilts have an S-bend which wraps comfortably around the back of your shoulders. Another bend at the foot platform (about 10 inches above the ground) places your weight directly over the lower pole for vastly improved control. Walkaroo Balance Stilts also quickly adjust to accommodate anyone from 4 ft. (122 cm) to 6 ft. 6 inches (198 cm), so the whole family can get in on the fun! 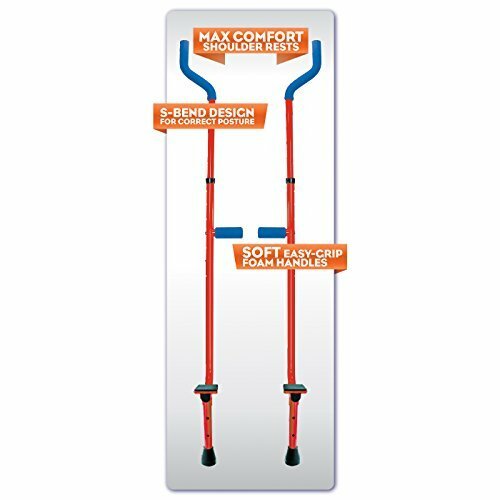 For advanced stilt-walking, also purchase our Xtensionz 4-Piece Set (with 2 types of stilt extensions!) for more vert, more spring and more FUN! Includes two types of extensions to increase the height of the stilts. For younger kids, look for Walkaroo JR Aluminum Stilts.